Spray a grill pan with nonstick cooking spray and warm over medium high heat. Add cherries. 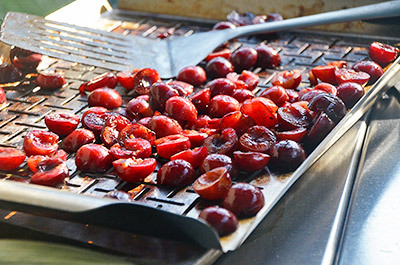 Once they begin to sizzle, flip or stir frequently so the cherries are grilled on all sides. Once the cherries soften and become slight charred, 3 to 4 minutes, remove from heat and serve immediately.